Pantone specialize in providing a range of products which are designed to help printers and designers to achieve standardized colouring solutions. In this article we will look at a couple of the most popular products which are utilized by the graphics industry. 1. Pantone Formula Guides – These are available in each of the coated, uncoated or matted styles. They are primarily targeted towards people who work as printing professionals or graphic designers. These guides display a total of 1,114 Pantone colours. They are particularly print – industry friendly, with CMYK reproducible colours clearly marked. They are presented in the traditional Pantone fan – style booklet, making them ideal for presentations to interested potential clients or on the press. 2. 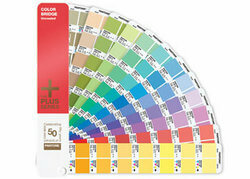 Pantone Colour Bridge – Again, this product is presented in the fan – style booklet. The European version is used to determine how Pantone colours will appear when printed on a coated paper stock. It can also be used to help visualize and create Pantone colours on a computer. Additionally, it provides guidance regarding how each particular Pantone colour will appear when it is reproduced using CMYK printing technology. This is helpful since CMYK uses fewer colours and therefore not all Pantone shades will be recreated perfectly. When ordering any of these products, please note that Pantone’s general guidance is that, whilst the products are strong and durable, to maintain complete accuracy they should be replaced about once every 12 months. This is to avoid colouration damage caused by exposure to light.